To keep her mind off her worries, she throws herself into organising the Christmas show at the local school. And when handsome Joe Blackthorn becomes her assistant, Georgine’s grateful for the help. But there’s something about Joe she can’t quite put her finger on. Could there be more to him than meets the eye? Georgine’s past is going to catch up with her in ways she never expected. But can the help of friends new and old make this a Christmas to remember after all? Review: As an avid reader of books by Sue Moorcroft, as well as a lover of Christmas fiction, I have been looking forward with great anticipation to her new Christmas story. As I had expected, this book was easy to read, grabbing my attention right from the start and holding it to the last page. 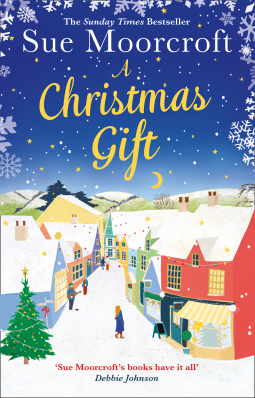 In common with most of Sue Moorcroft's books, this one has a really inviting cover, in this case making the reader think instantly of Christmas. As with many of Sue's previous books, this story is set in the Cambridgeshire village of Middledip, much of the action taking place in its performing arts college. Georgine France, who has lived in Middledip all her life, is events director at the college and is currently run off her feet organising the annual Christmas production. Principal of the college, Norman Ogden, surprises her with the introduction of a new member of staff, Joe Blackthorn, who is going to assist her with this task. However, it turns out that he may not be quite what he seems at the start. He seems familiar to Georgine, and as the story progresses surprising details of his past and present life come to light. To add to Georgine's load, she has financial troubles preying on her mind, as well as having to keep an eye on younger sister Blair and ailing father Randall. All in all, a busy and stressful festive season for her. Although this story plunged me into an area I am unfamiliar with, from staging a musical production to the world of rock music, I absolutely loved it. Through Sue Moorcroft's skillful story telling, I became totally absorbed in the tale, actually finding myself nervous that anything might go wrong on the night and worried about the outcome of troubles experienced by the main characters. Above all, though, it made me feel Christmassy, surely the best recommendation for a book published at this time of year. Share book reviews and ratings with Fabulous Book Fiend, and even join a book club on Goodreads. Fabulous Book Fiend has read 3 books toward her goal of 104 books. Ethereal theme. Theme images by imacon. Powered by Blogger.